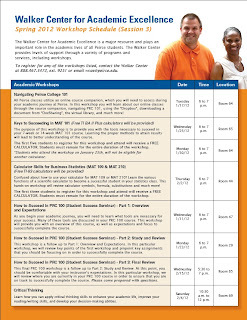 A fresh schedule of spring workshops at the Walker Center for Academic Excellence is now available! Workshops are broken down into several categories to help you develop your academic skills, navigate new technologies needed to succeed in your course work, and balance your personal life with student life. 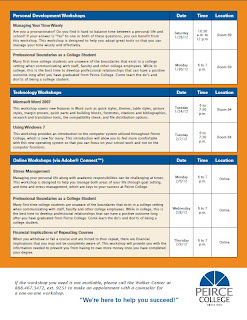 Below is a flyer detailing all of our upcoming workshops, so read on for more information. There are plenty of great resources lined up to help you make the most of your academic experience. To register for these workshops, email the Walker Center or call 888-467-3472, ext. 9251. Be sure to reserve your spot today!